Who loves chips?! I certainly do! My husband Mike has a ‘chip ranking’ of our favourite places in Melbourne that sell the best chips (hilarious but true). If we’re in the city we’ll sometimes call past one of these places just for their fries. Now, revealing that list is for another time, as today we’re here to talk baked sweet potato chips! And who doesn’t love a crispy baked sweet potato chip?! The indulgence of ‘chips’, with a healthier take. Winning! I posted a little preview of this recipe over on Instagram the other day, not realising how popular the photo and recipe was going to be! After reading everyone's comments, I’m now feeling the pressure to deliver on the perfect baked crispiness. ☺ I will do my best to describe in details the process and how I get the crispiest baked sweet potato chip. I think one of the tricks to this recipe is ‘less is best’ when it comes to using oil. You don’t want too much, as the oil can make the chips a little soggy. Also, I like to crank the heat in the oven close to the end of the baking time to help the crispiness along, but without burning them (a couple may get a little dark around the edges of the tray… a small sacrifice for the crispiness of the other chips). I hope you enjoy the recipe, and please feel free to suggest your secret tips for the ultimate ‘sweet potato crispiness’ in the comments below. I’d love to hear from you! In a large mixing bowl combine the coconut oil, smokey paprika, chili flakes, turmeric and a generous pinch of sea salt. Add the sliced sweet potatoes to the bowl and mix together with your hands, coating the chips with the coconut oil mixture. Place the chips onto three-four paper lined baking trays, ensuring they are evenly spaced and no chip is touching another (this helps the chips become nice and crispy). Place the trays into the pre-heated oven and bake at 180 degrees celcius for roughly 1 hour and 15 minutes. Once the chips are cooked and are looking crispy, remove the trays from the oven and sprinkle with flaked sea salt. Scoop the avocado into a medium sized mixing bowl and squash with a fork. Mix through the coconut cream, lime, half of the coriander, a generous pinch of sea salt and some freshly cracked black pepper. Scoop the avocado mixture into a serving bowl, top with fresh coriander, a sprinkling of chili flakes and a drizzle of extra virgin olive oil. 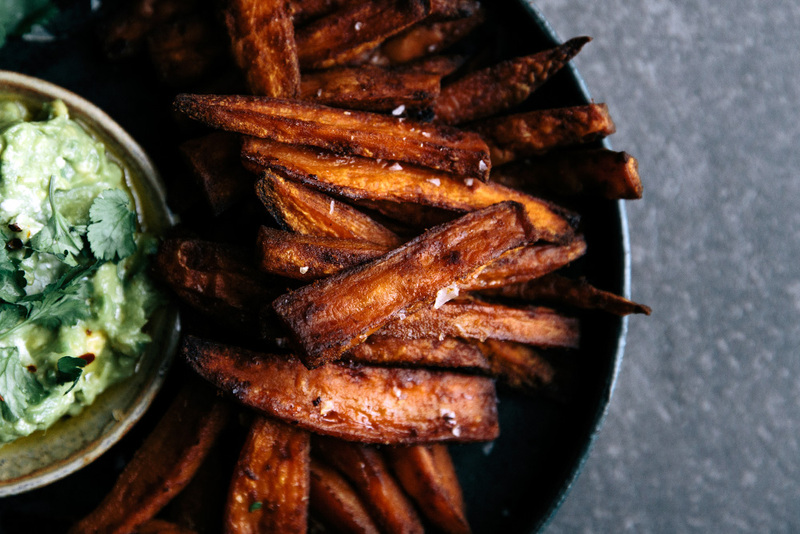 Serve the sweet potato fries and the coconut and lime avocado together for a delicious snack, light lunch or as a side. Enjoy! There’s nothing like baking your own bread in the kitchen.